For quite some time now, MSX developer Z80ST had been brooding on a product which easily qualifies as one of the most anticipated MSX games over the past 4 years. 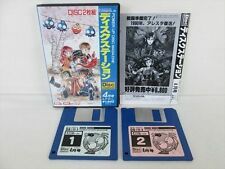 Since its announcement, QBIQS sparked enthousiasm among the MSX scene for being a remake of Konami classic Quarth. However, QBIQS would work on any MSX machine instead of only MSX2 and higher, having all the gameplay elements and extras featured in the original and more, while at the same time maintaining a pixel-perfect smooth scroll, contrary to Zemina's interpretation Block Hole which was heavily inspired by Quarth as well. Alas, the development of QBIQS was plagued by delays, causing it to miss several contest deadlines, but finally - this MSXdev edition the official release is a fact. This is good news, since until now there was only one entry yet, namely NeoPONG512 - but well, you know how it usually goes with MSXdev, total silence at first and when the deadline gets in sight, a flood of great new MSX games. Let's hope QBIQS is the wrecking ball demolishing the dam which holds back all those future entries. Without more ado, if you feel like having a relaxing brain-workout while witnessing what a simple MSX machine can be capable of, don't stall any moment longer! The game comes as a 48KB ROM and requires 16KB RAM. Manual and sticker are present as well. Go get it! There are some interesting puzzles in there. Even if you've played Quarth to death (like me ), it's not 'boring' since there are some shapes which were never used in the 'original' (such as 3x1 and 2x2). I must say, with some of the puzzles, there's the little thing that you do see what the creator of the puzzle meant, but you won't merge it into one big rectangle simply because of the (much higher) scrolling speed and quickly decide to break down the puzzle and remove the particles one by one. Oh, and I do really miss the silver and golden blocks! Anyway, it's very entertaining, fast, and hard. Didn't even get past the end of level 4 yet..
Oh well, let's try the 2-player mode tonight with my visitors. And ofcourse... thank you for this game!!! @DemonSeed: We could "netplay" using meisei? Don't forget you can slow-down speed if you have enough combos to do that... look at the manual!! Things will go really hard on level 6 and higher But it's possible to finish the game (I'm not the only one who has finished it), even without continues!!! 2P mode is very fun, and you can select different difficulty levels for each player, I hope you will like it and enjoy a lot while playing. @ Huey OMG, you touched my heart. @ SapphiRe: I...see! Totally read over that due to a severe attack of "I wanna play!!! I wanna plaaaaaay!!!" Yes, and am already enjoying it - really looked forward to this release! I hope this will spark many more excellent MSXdev games. This game is really well done. I was quite impressed by the earlier demonstrations, but the final game exceeded all my already high expectations. One of the best games, if not the best game, made this millenium. Great game ! Welldone ! One of the best games, if not the best game, made this millenium. Yes and Arkanoid was the best game in the 1980's, w000t! !